Esther is a part of the 2018 graduating class at Uhuru Academy. 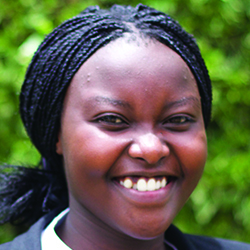 She attends Uhuru Academy, along with her sister Margaret, who will graduate next year. Esther lives with her father and three other siblings in Vumilia Camp near Maai Mahui. Her family moved to the camp in 2010 after their home was burned down during the post-election violence. Esther would like to become a doctor to help people. She has learned that many poor people cannot afford to visit a doctor, and are suffering from easily treatable illnesses. When she becomes a doctor, she would like to give free service to people in poverty. Esther’s favorite Bible verse is Romans 5:1-4, because it encourages her to rejoice in her sufferings and remember the hope and peace of God.